If you are at all like me, you will probably find yourself with cramping hands and unhappy wrists after an hour or so of miniature painting. This is often caused by the fairly intensive grip required to hold a model by the base over time. For a while, I was nearly unable to paint because the cramping in my left hand caused tremors that made painting almost impossible. Fortunately, I was able to find a way to alleviate this that is cheap, fast, and effective! This is the lid to a spray paint can. You probably have a few active cans right now, and you have likely thrown away more than a few of these guys. I know that I have myself. 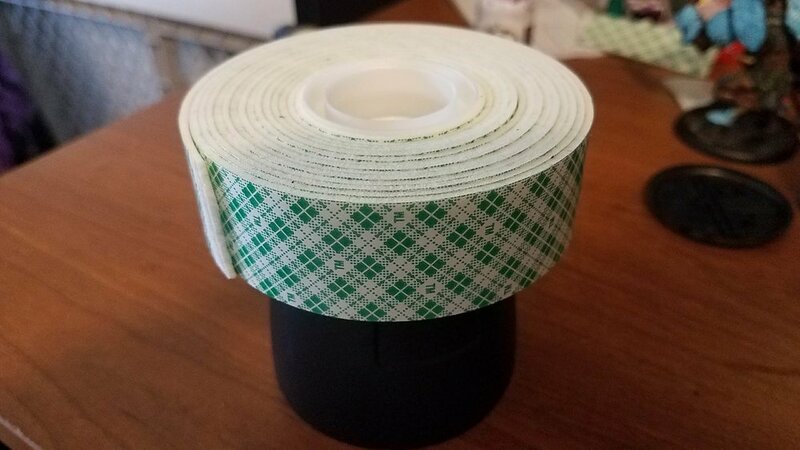 This is double sided mounting tape, which is specifically able to support a fairly large weight per square inch. Regular double sided tape will not do. This stuff is about an eighth of an inch thick and cushiony, allowing you to push the base into the tape to get better contact for holding the model in place. You can find it at most stores, or here at Amazon. Simply take a piece of your tape, cut it to the appropriate length for your spray can top, and apply it. Peel the top off and push the model you are painting firmly into place, and voila! No more hand cramps! The above is a fully metal model being supported by one piece of this mounting tape. I've painted for about 15 hours so far, and even taken the model off to play a game and then put it back on afterwards with no slippage. My toddler knocked it over without the model coming off, which is pretty impressive! All in all, this will cost you pennies per model and also help your hands to stay steady and pain free while you paint.